5a: Caster unleashes a small wave of magic in front of her. Hits mid. 5b: Caster sweeps upwards with a wave. Hits mid, launcher. Moves Caster forward. 5c: Caster conjures a fireball in front of her that explodes immediately. Whiffs at point blank. Hits mid. 2a: Caster sweeps at the opponent's feet with a wave. Hits low. 2b: Caster sweeps at the opponent's feet with a large wave, tripping them. Hits low. 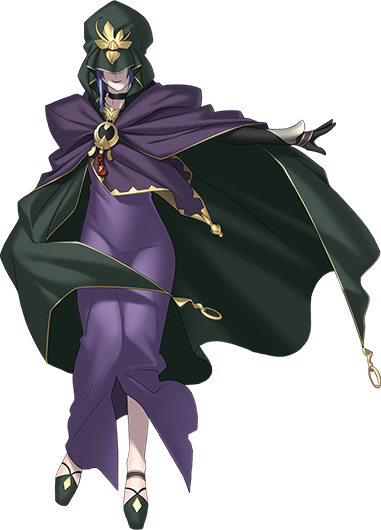 2c: Caster conjures a fireball in the air in front and above her that explodes immediately. Launcher, hits mid. Pushes Caster back slightly. 6b: Caster sweeps downwards with a large wave. Hits mid. 6c: Caster calls down lightning in front of her. Whiffs in throw range, hits mid. j.a: Caster sweeps downwards with a wave, and then falls down quickly unless followed up. Can be short hopped, hits high. Very quick. j.b: Caster conjures a fireball in front of her that explodes immediately. Hits high. j.c: Caster jumps up and spins in the air, slowing her fall, then conjures a fireball in front of her that explodes immediately. Can be short hopped. Hits high. 236a/b/c: Caster conjures projectiles in front of her. a version = Caster fires 5 small bullets. c version = Caster fires a straight laser. j.236a/b/c: Caster conjures aerial projectiles at a 45° angle downwards. a version = Caster fires 5 small bullets in a downwards arc. b version = Caster fires a small, slow-traveling ball of energy downwards. Does no chip damage. c version = Caster fires a straight laser downwards. 214a/b/c: Skeleton summon. Hits mid. Causes cooldown for 214 and j.214 skills. a version = Dashes forward a small distance and attacks. c version = The skeleton launches the opponent in air, slower than other verisons. j.214a/b/c: Skeleton summon. Hits mid. Causes cooldown for 214 and j.214 skills. a version = The skeleton dashes forward a small distance and attacks. 623a/b/c: Caster calls down projectiles. Causes cooldown for 623 and j.623 skills. a version = A blizzard rains down in front of Caster. b version = A meteor falls down midscreen ~3 seconds after the cast. c version = Lightning strikes down 3 times at the opponent. Requires meter. j.623a/b/c: Caster calls down projectiles. Causes cooldown for 623 and j.623 skills. c version = Lightning strikes down 3 times at the opponent. 22a/b/c: Caster draws a magic circle. Causes cooldown for itself. a version = A binding spell assaults the opponent from above. Unblockable, but can be crouched under. b version = Caster conjures a magic circle directly below the opponent. It teleports the opponent into the air and drops them. Unblockable. c version = Caster conjures a magic circle on the ground. Can only be used at point blank, stuns the opponent. Does no chip damage. a version = Teleport forward. b version = Teleport clockwise and backwards. c version = Teleport counter-clockwise and backwards. 63214c: Ground trap, stun opponent on hit. j.421a: Caster levitates, continuously draining her meter. She can dash (faster than on the ground), attack, or descend while levitating. The effect ends when her meter runs out. Double jump to self end flight. 236236a: Caster conjures a barrier in the air in front of her. If the opponent hits it, Caster counters with Rule Breaker, reducing the opponent's mana to 0. 1500 damage. For the duration, Caster no longer has a cooldown when using certain spells. 236236c: Caster places a magic circle on the ground using her staff. If it hits, she flies above and rains down lasers from the sky. Then she rains down some more lasers. 4000 damage. Reset setup, from there you can high/low/throw safely. Can be ended with 63214c.